La Fille aux yeux d'or is set in April 1815, in the middle of the 'Hundred Days' of Napoleon's brief return to Paris and to power. 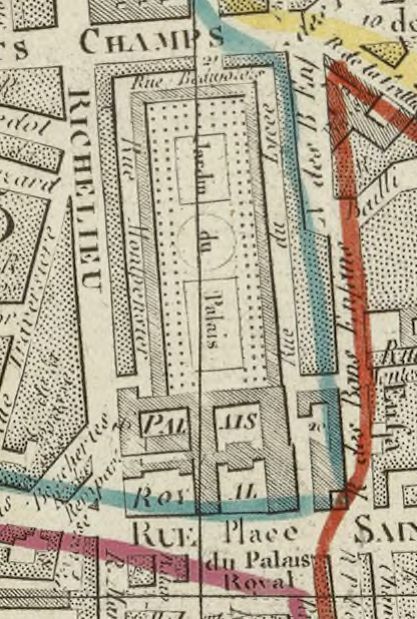 The map above is from that year, but must date from before March or after June because the nomenclature is that of the Restoration in April 1814, when the Place de la Concorde became again the Place de Louis XV, the Quai Bonaparte became the Quai d'Orsay, the Rue Napoléon became the Rue de la Paix and the Rue Bonaparte became a blank on the map until a new name could be decided (by 1818 it had become the Rue Saint Germain des Prés). 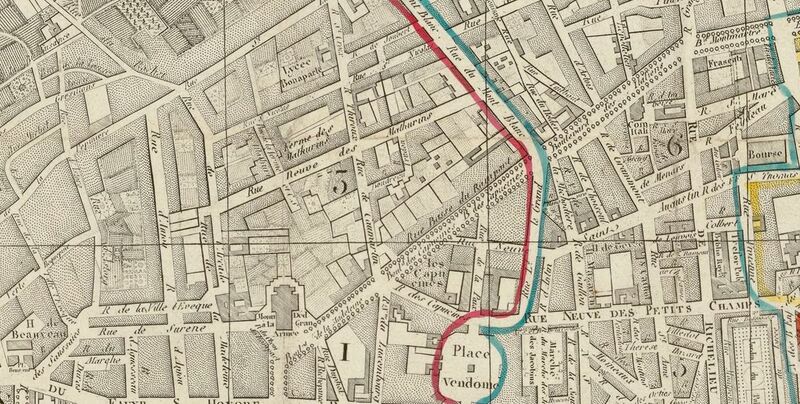 On this map the Lycée Impérial has become the Lycée Louis-le-Grand and the Lycée Napoléon is the Lycée Henri IV, but oddly the Lycée Bonaparte on the Rue Saint Lazare is not yet changed to the Lycée Bourbon (it would later become the Lycée Condorcet). During the Cent-Jours the Place de Louis XV became the Place de la Concorde once again, briefly, but in La Fille aux yeux d'or it is referred to by its Ancien Régime name: 'En la suivant au bout de la terrasse, du côté de la place Louis XV, il aperçut le vieux marquis de San-Réal...'. 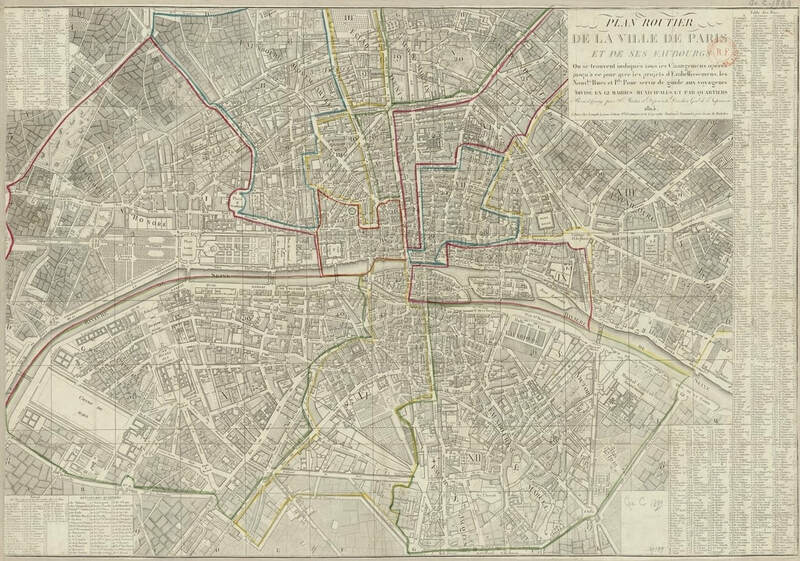 When the narrator refers to the Rue de la Paix we could say that he is speaking in general terms in the present tense, so the use of that name would be justified, even if during the Cent-Jours the Rue de la Paix became again the Rue Napoléon. 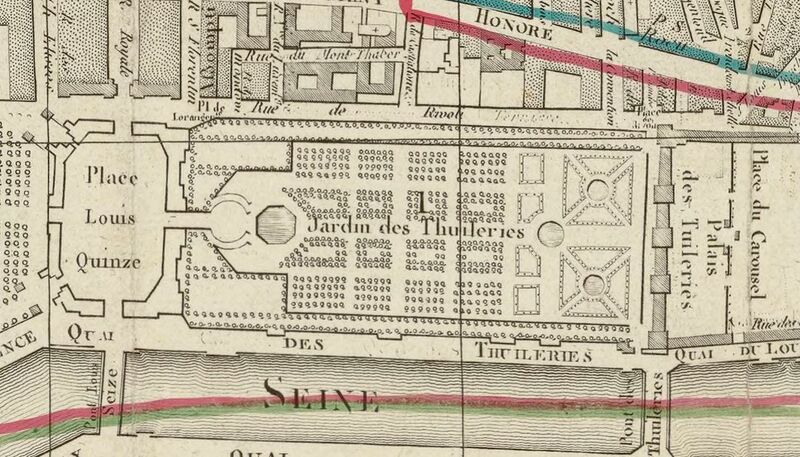 All of the other places named in the published text or in the manuscript are unaffected by changes of nomenclature: Tuileries, Rue Castiglione, Boulevard Montmartre, Boulevard des Italiens, Rue Montmartre, La Madeleine, Rue des Saussaies, Rue Saint-Lazare, Rue de la Pépinière, Rue Neuve des Mathurins, Rue de la Chaussée d'Antin, Rue des Trois Frères, Rue de l'Université. The locations of the novel are marked in black on the map above. With the exception of no. 54 Rue de l'Université, where Marsay lives, all of the locations are rive droite​. The area of the action can seem restricted when compared to the area covered by the whole of the map (right), but this is a map of Paris and its faubourgs. Paris alone is not much bigger than the area covered in La Fille aux yeux d'or, the action of which which never ventures extra-muros. The night before his first rendez-vous he had dined and gambled at the Rocher de Cancale, on the Rue Montorgueil (below), and in the manuscript there is mention of a dinner with Paul de Manerville 'chez Véry', the restaurant on the Rue Beaujolais by the Palais-Royal (right) that is now the Grand Véfour. For the reader, finding these locations is simple enough: every named place in the published text or the manuscript is matched with that place-name on a map. The text itself, however, describes elaborate efforts made by its characters to discover the place where Paquita is. Firstly, De Marsay follows Paquita in a cab to the house on Rue Saint-Lazare. His servant Laurent then learns from the postman the name of those who live in the house, including Paquita, and De Marsay is able by devious means to get a letter to her requesting a rendez-vous. The arrangement is made and De Marsay meets Paquita's servant on the Boulevard Montmartre. 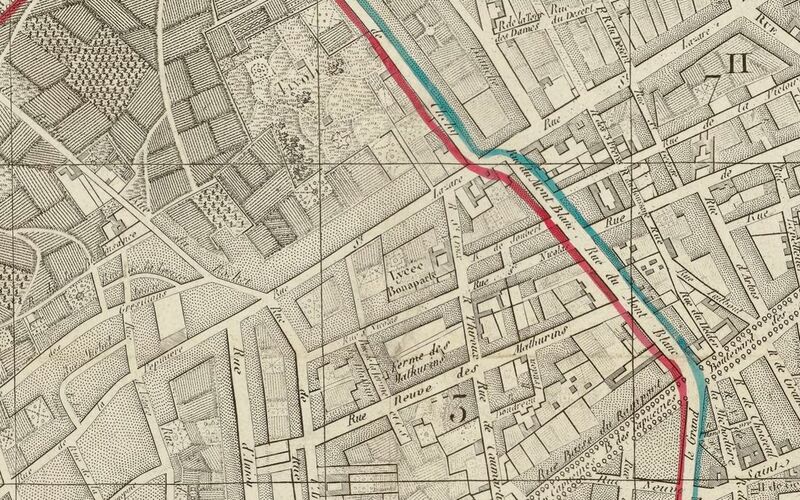 This first journey is the one we can trace on the map above, but De Marsay is so distracted by his thoughts that he is unable to work out where the carriage is going and he doesn't know 'where the vehicle stopped'. For the journey to his second rendez-vous with Paquita De Marsay is required to wear a blindfold. 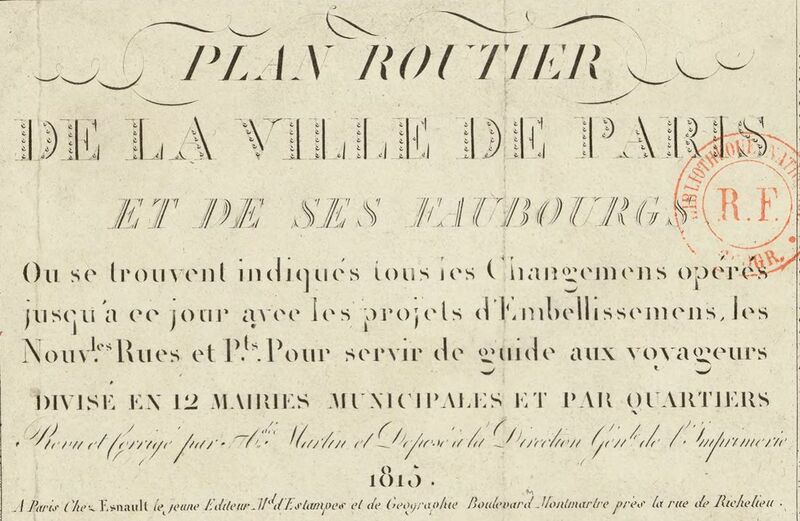 This time, as 'a young man who knows his Paris', he hopes to be attentive to the details of the journey and work out his destination, but he is overcome by emotion and is unable to concentrate, so is again brought to an unknown place. The irony is that this different place is Paquita's home, the address of which he had himself discovered days before when he followed her. ​For the journey to the third rendez-vous he is again blindfolded but this time he concentrates and is almosty certain that he has been brought to the house on the Rue Saint-Lazare. When he leaves, no effort is made to hide the fact that he had been at that address. ​A week or so later, when, with Ferragus and other confederates from the Thirteen, he comes there again to kill Paquita, he has brought a map of the house, but Ferragus declares that he has no need of a map to work out who is where in the house. 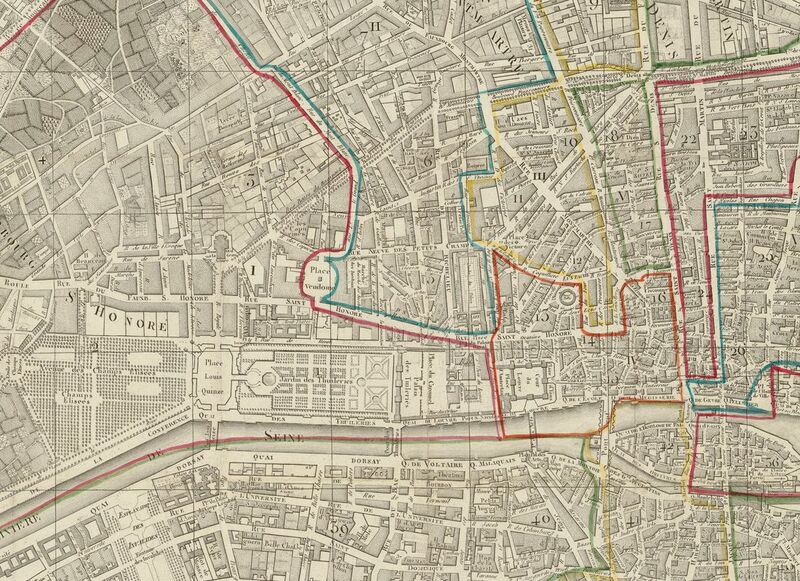 Readers who need maps to find their way around Balzac's text are awed by such topographical acuity.